Imagine going to work and wondering if you left the light on, or the thermostat too high, I’m sure it’s happened to you. Just think what it would be like if you could control your thermostat, lighting, or video surveillance all from your smartphone. Having this capability would allow you to easily and more efficiently manage energy usage as well as keep an eye on your home and loved ones. Thanks to the advancements in modern technology, wireless home security automation is a thing of our present. What is home automation? It allows for a homeowner to access and control the video monitoring, climate, security system, and the home’s appliances from a remote or centralized location. Sometimes life throws us a curveball and we can’t make it home to meet the kids off the school bus, or maybe some unexpected cold front sweeps through while you’re away. With this auto home system homeowners can easily access their video monitoring system and watch what is happening live in their home when they can’t be there. Why restrict yourself to the convenience of use only when you are away? Use your cell phone from your bed to control the lights! 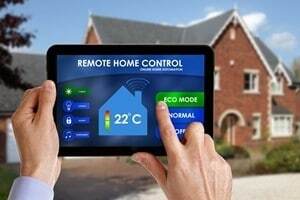 Home automation systems or “smart” products can help you manage your home’s energy consumption, when used properly. For instance, access your thermostat and adjust the temperature throughout the day around the times the house is empty or someone is home. Some appliances will allow homeowners to sync up “smart” devices to appliances collecting real-time energy information. This information helps appliances calculate the most cost-effective times to operate. For instance, your dishwasher may start a load at 1:00 AM because at that time it is costing you the least to run it. As we have already covered, interactive home security can give you peace of mind that is simple and convenient. Being able to access your home security from a remote location to check on your home at any given moment is priceless. Some systems even allow you to interact with your home’s security, giving you the ability to disarm or arm your residence remotely using your smartphone. Complete home automation systems will also contact you by voice call or text if there is unusual activity at your home. A complete automatic home security system is pairing the need for protection with flexibility and ease. These systems ideally can help you and your family become more conscious of your energy consumption and help save you money if managed properly. Most importantly, interactive security systems allow homeowners to customize their system to benefit their lifestyle and needs.